There are two ways to order SCF&R goods. 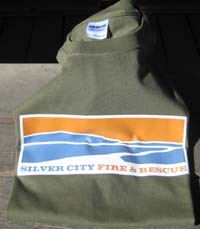 All your purchases support the critical work we do providing emergency fire prevention support to the Silver City area. Wait about a week (after we deposit your check) and find your SCF&R items in the mail! Keep scrolling to see our t-shirts, hats, and greeting cards. 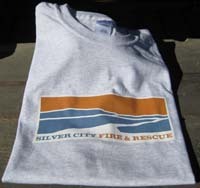 Heathered light gray cotton t-shirt with screen-printed SCF&R logo in orange, blue and white.All shirts are 100% thick cotton, Gildan Ultra Cotton brand. 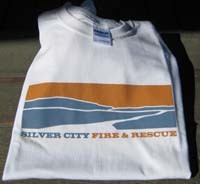 Cream with screen-printed SCF&R logo in orange, blue and white.All shirts are 100% thick cotton, Gildan Ultra Cotton brand. 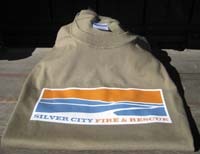 Khaki cotton t-shirt with screen-printed SCF&R logo in orange, blue and white.All shirts are 100% thick cotton, Gildan Ultra Cotton brand. Olive cotton t-shirt with screen-printed SCF&R logo in orange, blue and white.All shirts are 100% thick cotton, Gildan Ultra Cotton brand. 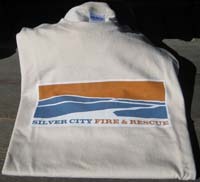 Navy blue cotton t-shirt with screen-printed SCF&R logo in orange, blue and white.All shirts are 100% thick cotton, Gildan Ultra Cotton brand. 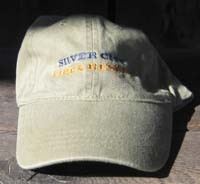 Soft khaki cap made of garment-washed brushed cotton. 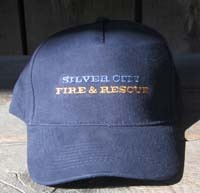 The logo is embroidered in medium blue (Silver City) and orange (Fire & Rescue). This low-profile hat has a cloth strap with tri-glide buckle closure. Navy blue cap made of garment-washed brushed cotton. 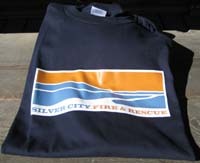 The logo is embroidered in medium blue (Silver City) and orange (Fire & Rescue). This hat is slightly taller in the crown, but is still soft and unstructured. Cloth strap with Velcro closure. Embroidered seal features the SCF&R logo in yellow/orange, medium blue and white. “Idaho” is printed in orange. Seal can be ironed on to clothing, backpacks and more. Set of five greeting cards featuring photos taken in and around Silver City, Idaho. From left to right, photos are: Silver City school house, cabin, pond and mountains, view of the town from Morning Star mountain, and daffodils next to a fence. “Silver City, Idaho” is printed on the front of each card. Cards are blank inside. Cards are 4 1/4″ x 5 1/2″ and come with white envelopes. Set of 14 greeting cards featuring a beautiful close-up photo of an Owyhee County wild iris. 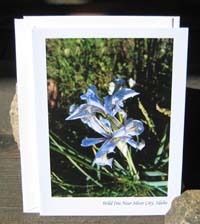 “Wild Iris Near Silver City, Idaho” is printed on the front of each card. Cards are blank inside. Cards are 4 1/4″ x 5 1/2″ and come with white envelopes. 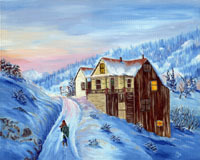 Set of 12 greeting cards duplicating a painting of a whimsical holiday scene at the entrance to Silver City. Original painting is by Cheryl Burril. Cards are blank inside. Cards are 4 1/4″ x 5 1/2″ and come with white envelopes. 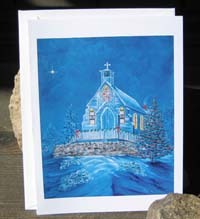 Set of 12 greeting cards duplicating a painting of the Silver City church. Original painting is by Cheryl Burril. Cards are blank inside. Cards are 4 1/4″ x 5 1/2″ and come with white envelopes. 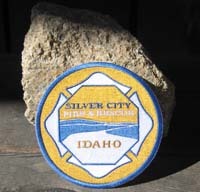 Silver City Fire & Rescue is powered by	WordPress 4.2.23 and delivered to you in 0.115 seconds using 16 queries.